For one of the most useless and short-lived Autobot leaders of all time, Ultra Magnus sure has a following, as evidenced by this custom toy showing what he'd have looked like had he turned up in War For Cybertron. 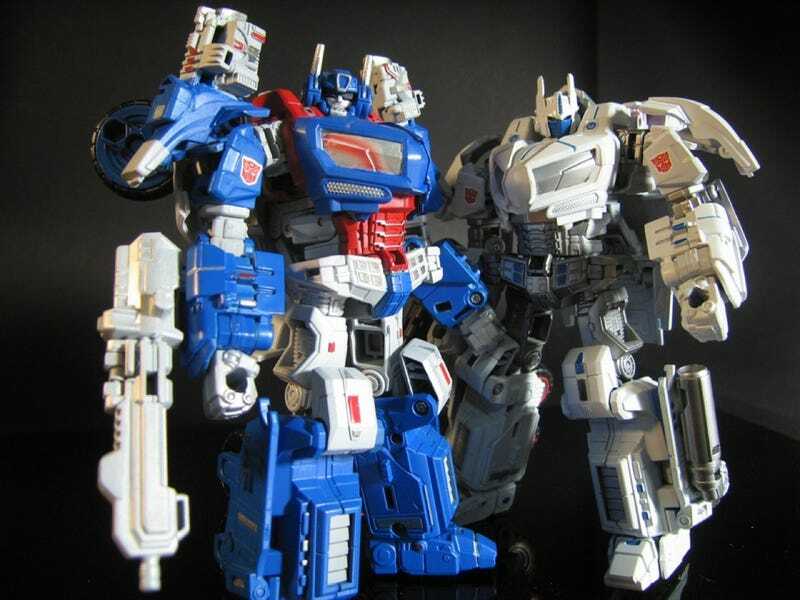 There are two figures; one for the purists, showing Magnus in the same all-white colour scheme as his original toy (which in basic form was a simple repaint of Optimus Prime), the other with some custom armour bringing him closer to his more common red-white-and-blue appearance from the cartoons (and his clumsy toy armour). The toys are again based on an Optimus Prime figure, this time his War for Cybertron variant, and are currently for sale on eBay. The colours look great, but my only complaint would be that there's no car trailer. I know, there's no need for a car trailer on Cybertron, but damnit, he could have had a...hover-car trailer instead.